Home / Golfers Gallery / Carter, Captain Ernest F.
Carter was a semi-finalist the following year losing (unluckily some say) to C.L. Crawford ( Portstewart) when the Irish Close Championship was played at Castlerock. If there were ever a case for stymie abolitionists, this match would stand out like a sore thumb. The players were a class apart yet some freakish putting by Crawford together with three stymies resulted in the match going the distance. To add insult to injury a bad bounce from the fairway into a rabbit scrape and a near unplayable lie on the final hole sealed the hole and match for Crawford. When luck runs its course the gap between good and great meant a one-sided final that finished on the eighth hole of the second round with Major Charles Owen Hezlet winning by a margin of 12 & 10. In the 1920 Irish Open Amateur Championship Carter suffered a crushing 6 & 5 defeat to Ector Munn from the North West club as his game especially his putting from close range just disintegrated before a large gallery. When the Irish Close Championship returned to Portmarnock in 1921 he succeeded in taking the trophy on the 12th May, again by a substantial margin. Despite 1919-1921 being the struggle for Irish Independence, the Championship continued regardless. The Saturday following the 1921 Championship there was a curfew in place in Dublin between 10.30pm and 4am. Ireland was still a further two months from a truce and the IRA had stepped up its campaign of violence and guerrilla warfare in the Spring. In the 1920 South of Ireland Championship which Carter won, the legendary Irish golfer John Burke, adjutant of the local IRA Battalion based in Ennistymon, recalled in the Connacht Tribune (14 September 1973) an incident during the final. Burke, his brother Tom and Pakey Lehane took down the Union Jack flag and set it on fire, replacing it with the Irish tricolour. As the match approached the second hole the officials noticed the change and british military personnel were quickly on the scene to replace the Union Jack flag. When the events were repeated the whiff of trouble in the air ensured a vastly reduced gallery to watch Carter now attached to Milltown beat Derry O’Brien, the Douglas player, by 10 & 9. Carter played in the British Amateur Championship 1920 at Muirfield, the first post-war championship but despite winning his first round match by 10 & 8 he was knocked out in the second round. In 1921, at which stage he was playing out of Royal Dublin, he lost his first round match to P. Hunter from the US by 4 and 3. In 1922 when it was played at Prestwick he reached the quarter-finals in a match against William Irvine Hunter, in what many considered a travesty as he was seen as the finer golfer. The defining moment in the match came when Carter’s drive at the sixteenth was too well struck insofar as it trickled into the Cardinal’s Bunker and he failed to find the green after three attempts eventually picking up and losing the match by one hole on the eighteenth in front of a crowd of six thousand. It was afterwards reported that so impressed were the powers that be with his golf that he was picked as part of the international team to go to America. However, when the team was finally announced on the 22 June neither Carter or William Irvine Hunter (the 1921 Amateur Champion and 1922 semi-finalist), his vanquisher, were included even though they were, according to the papers, generally acknowledged as the best amateur golfers in Great Britain and Ireland, at the time. The international team event referred to above was the inaugural playing of the Walker Cup at the National Golf Links of America in Southhampton, Long Island. Ironically he would eventually spend much of his time in America playing on Long Island and its environs. In 1922 Captain Carter won the short-lived Welsh Open Amateur Championship at Royal St. David’s Golf Club by beating Bernard Drew from Stoke Poges in a classic and, it has to be said, uncharacteristic fight-back during the final stages of a championship. Bernard Drew was the favourite going into this match and from the evidence of the first round the reason was clear as his steady golf meant Carter went into lunch three down. In the afternoon Carter turned in a display of exhibition golf, so much, so that by the fifth he had taken the lead and closed out the match on the fifteenth by 4 & 3. Carter was again affiliating himself to Royal Portrush and in the fourth round of the championship he had defeated Major Charles Owen Hezlet from the same club. Their absence from the team couldn’t be easily be explained but the New York Times felt that although there was no official explanation there may have been a question mark over their amateur status as they had some connection with golfing firms: despite this there were allowed play in the British Amateur and were never given non-amateur status. The loss by the GB&I by 8 games to 4 made their non-selection even more controversial, given the seemingly inexplicable reason for not choosing either player. The R&A gave a three month notice of a proposed ban on players making monetary gain from their skill on the golf course and to this end Carter resigned his association with a golf ball firm before his move to America which the R&A may have taken into account in deciding whether his amateur status would remain. After the Welsh Championship he accepted a wager by a well known lady golfer that he wouldn’t put a ball into Harlech Castle from the golf course. 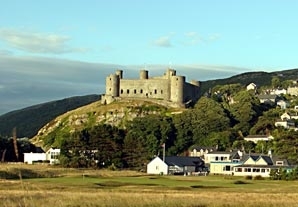 The nearest point on the course to Harlech Castle was two hundred yards away and would require the shot to scale the battlement walls that guard the castle, two hundred feet above the level of the course. Using a baffy he failed at his first attempt but managed on his second and repeated the feat a further two times. As the feat was officially witnessed it was recorded in the record books as such and the odds for the bet were struck at one hundred to one so this feat earned him £100 (present day equivalent of EUR5k) which doesn’t appear to have interfered with his amateur status. Just as well it hadn’t happened before the selection of the International team as it would have given the Royal & Ancient just cause for his non-selection. Alas, that was one record of the story, another, according to Richard Fisher’s, A Centenary History of the Royal St. David’s Golf Club was that the wager was never paid, whether this was someone welshing (if you’ll excuse the pun) on a half-hearted bet or an act of chivalry on Captain Carter’s part isn’t recorded. All-in-all 1922 was a good year for Carter which all started when, over the Reuters newswire, came a report on the 22 February that Captain Carter had a record 65 strokes around the Biarritz course, Out: 4,4,4,3,4,3,3,5,3 = 33 ; In: 4,3,3,4,4,4,2,3,5 = 32. On the 8 January 1923 Carter boarded the White Star Liner – Baltic bound for America. He was due to spend three months in Florida playing golf but had no definite plans beyond that but it wasn’t for the want of offers. Carter played in that year’s US Amateur at Flossmore CC but was beaten by George Von Elm from Salt Lake City by 8 & 7. At the time Carter was playing out of Chicago. Von Elm was runner-up to Bobby Jones at Merrion in 1924, positions that were reversed in 1926 when the championship was played at Baltusrol. In 1925 Carter is recorded as having played in the US Open Championship at the Worcester Country Club but was well down the field finishing on 322 compared with the winning score of 291 managed by William MacFarlane and Bobby Jones, the former winning in a play-off. However, this was the US Open and most of the best golfers in the world were in the field including Hagen, Jones, Sarazen, Quimet etc. so it was an achievement just to find himself in such illustrious company. In 1927 he joined the Sands Point Club, Port Washington, New York as secretary. was the Club’s secretary and manager and literally devoted his life to it. in 1942, and has since gone to his Maker." Monetti continues by relaying the tough times being experienced by this “rich’s man’s” club following the great depression and Carter’s attempts to bridge deficits by going cap in hand to Harriman. Eventually in 1937 a foreclosure order was placed on the club’s premises but the largesse of an heir to the clubhouse resurrected it as the Sands Point Golf Club in 1940 and later renamed the Sand Point Country Club. All during this Carter seems to have been instrumental and remained as secretary of the new club.